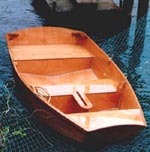 The Mertens-Goosens web site Bateau.com offers boat plans, including free plans for this 8ft dinghy, the D4 or Dink - they also offer paid plans for an updated version, the D5, pictured here. 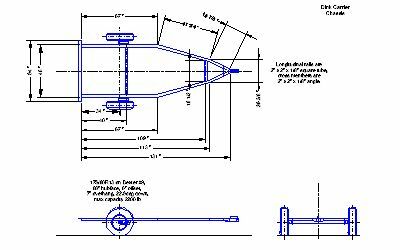 This dinghy is a lot simpler to build than the one on the original Trailerboat and so, at Marck's request, I have done a design for a trailerboat to carry the Dink - the Dink Carrier. The trailer design follows the slope of the front and rear transoms of the Dink and that effectively defines the size and shape of the trailer - just big enough to sleep in. The trailer provides a berth with maximum dimensions of 78" x 50", tapering to 32" at the foot. The design is shown in a 'conventional' teardrop arrangement with two side doors and a gallet at the back - accessed here by two oddly-shaped doors, rather than a hatch that would get in the way too much. The two doors are in part of the sides that is nearly flat, but nevertheless the doors and door openings would be difficult to build. The only practical method I see is to assmeble the trailer body complete and then cut out the doors once their shape has been fixed. As a much simpler alternative, it would be possible to eliminate the two side doors and use just one rear door - though this would lose part of the galley. 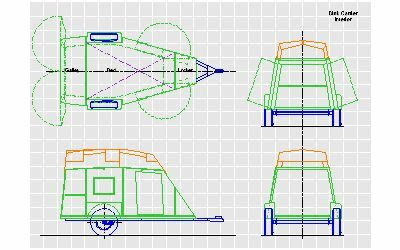 Like the Trailerboat, the shape of trailer sides and top panels will be obtained from Hull Designer (a free hull design program from Carlson Design). However this has not yet been done - email me if you want the files.